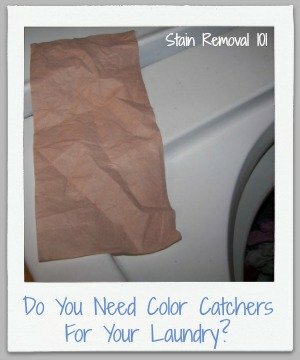 Do I Need A Color Catcher For My Laundry? If I Use A Color Catcher? Everyone knows, at least in theory, that they should sort their laundry into various piles, before washing, including sorting piles into like colors, so you don't get that pink sock or underwear effect from a dye transfer. 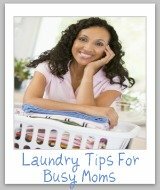 The thing is, that is a pain to do a lot of the time, and adds another step to the whole laundry process. Therefore, a special type of laundry product has been created to try to fix this problem -- little pieces of cloth specially formulated to grab bleeding dyes in the wash water and keep them from redepositing on other clothes. Please note that these catchers are not the same as dye or color remover products, which grab dye from fabric itself. The cloths don't do that, but instead are just supposed to grab dye from the wash water. These color catchers promise a lot, like being able to wash all your clothes together, including a bright red garment with your whites. The million dollar question, however, is do they really work as promised? The short answer to this is that people disagree. 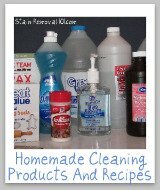 While some people swear by these cloths (see some of the reviews below, for example) other authorities (namely Consumer Reports) say that these products just don't work as promised, and you should just save your money and sort your laundry like we've always been told to do before. Here's the video from Consumer Reports showing their tests of two of the most popular brands of this product, Shout Color Catcher and Carbona Color & Dirt Grabber, and how they worked in comparison to just washing the clothes without the product included. I've personally tried some of these products (see my reviews below, along with other people's) and I have seen that they do collect dye. You can see that, for example, from the dark color of the sheet after the wash (see picture above). What I'm still trying to decide is if they collect enough dye to make it worth my while to use them, or if I'm just slowly making my clothes dingy by not sorting. 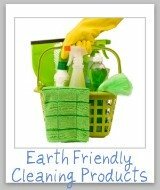 In addition, these products aren't cheap. It is obviously more frugal just to sort your clothes into various piles instead of using this product. Is the expense worth the convenience? 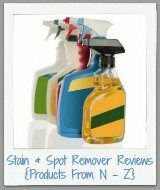 Here's some reviews of these products which address these very issues. I would love to hear your opinions about it too, so if you've tried one of them you can skip down to share your review here. 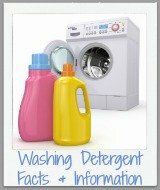 There are several products available for catching dye transfers that occur in the laundry, and if you've tried one I'd love to know how it worked for you, good or bad.